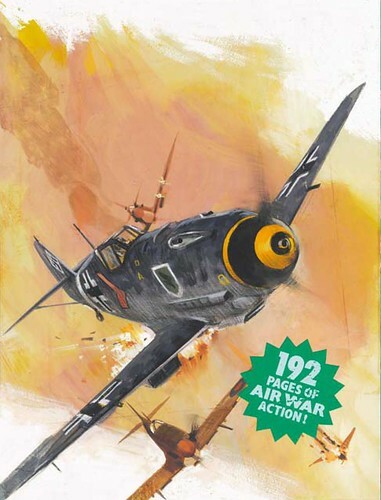 Pino Dell’orco was an aeroplane-obsessed schoolboy who grew up in Rome reading the comics of the legendary German/Italian artist Curt Caesar. Dell’Orco was something of a prodigy and as a teenager he became an apprentice to Enrico DeSeta before joining the Favalli studios to paint movie posters. Dell’Orco had absorbed DeSeta’s style so completely that he could (and indeed did) paint entire posters in his style, which DeSeta would then sign! In the late 50’s Favalli died and the studio broke up with most of the artists relocating to Milan to join the D’Ami studio. Dell’Orco, on the other hand, moved to London where he joined the Bryan Colmer agency. 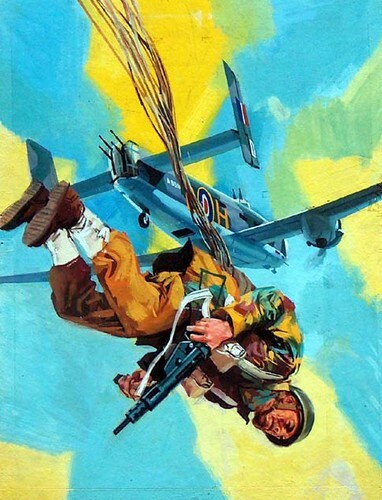 After a few years painting paperback covers Colmer approached Dell’Orco about the possibility of creating war covers for Fleetway and he jumped at the chance, going on to paint over 300 of them throughout the 60’s. As it turns, some of his fellow cover artists were his old colleagues at the Favalli studio -- Allessandro Biffignandi and Nino Caroselli, now based in Milan, though bizarrely the fact that they ended up working on the same comics was pure coincidence . 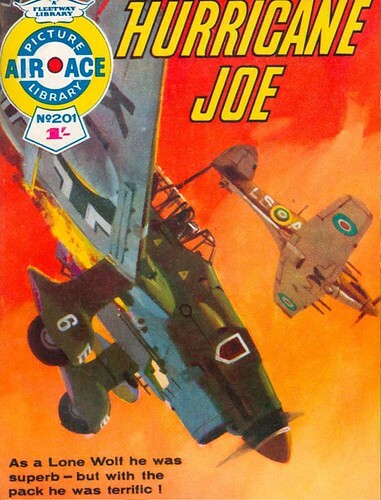 Pino Dell’Orco’s paintings were invariably masterpieces of design and this is particularly true of his many covers for Air Ace. Working on artboard roughly the size of a U.S. original comic book page he had a far more minimalist approach than DeGaspari. 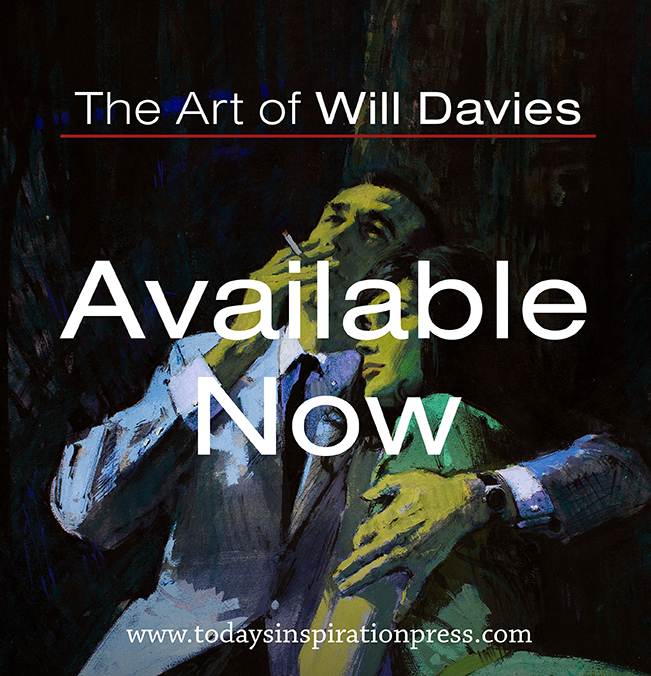 His paintings often employed quite thin blocks, even using the bare surface of the board as a background colour and employing quick flicks of the brush, charcoal or pencil for details. They have a dynamic immediacy that flies off the page - but even more than that - it is their composition that really makes them stand out. Dell’Orco’s covers are all about overlapping shapes, negative space, clashing colours, extreme perspective and vertiginous angles. The cover to Air Ace #156 is a terrific example of his extremely angled aeroplanes criss – crossing each other – indeed, they are almost abstract cover designs, beautifully complemented in this case by the classic early 60’s lettering. After my first book came out last year, several comic artists chatted to me about it and Dell’Orco was invariably their favourite. 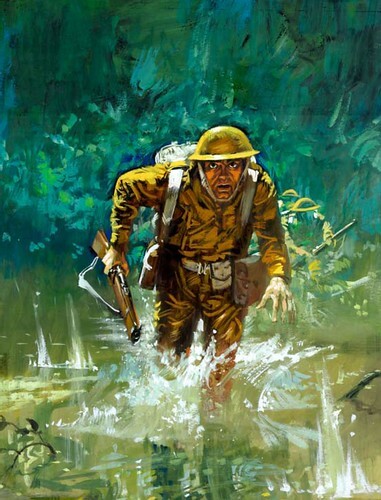 Looking at a picture like his cover to War #158, I think you can see why – his placing of the figure and orchestration of shapes is quite masterful. At the end of the sixties, the Colmer agency broke up and Dell’Orco returned to Italy where he still works today, with one of his most recent projects being a museum display devoted to – of course – aeroplanes. One of the nicest surprises of my first book was the fact that some of the original artists surfaced after years of (for me anyway) total obscurity. Pino had never had any recognition for his covers – and in fact absolutely no one even knew his name – but now he has at least some of the recognition he so richly deserves, which I find immensely satisfying. And having chatted to him on the phone he turns out to be a terrific chap as well! Great images, shame we can't get high-res scans of them! I'm sure IPC have their reasons though. Can I request individual scans of the covers which have been grouped together? Even at the res you have here would be good. Great job though, and great blog! Dave; I appreciate your enthusiastic comment - thanks. While I wish I could make scans available, since these images are from an 'in print' book currently being sold I don't think it would be appropriate to distribute scans of any higher resolution. For those interested, I have linked the titles of the two books in the concluding paragraph of each day's post to the Amazon.com location where the books can be purchased - there are many images in the books that are the full size of the page (there even some double page spreads) and, as David mentioned, the printing quality is excellent. Great stuff Leif. I'm a sucker for all that WWII airplane art, and the real planes for that matter. On Labor Day out here in the Burbank CA area, we had a P-51 Mustang chase a P-38 Lightning for about a half hour in the sky over my house. It was so cool. Great art! 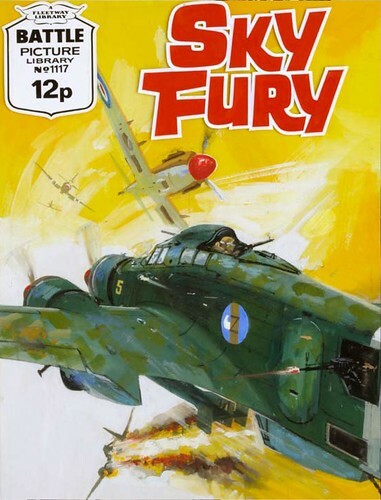 That is great lettering on "Sky Fury." Yeah, I agreem harley - I'd love that on a t-shirt!